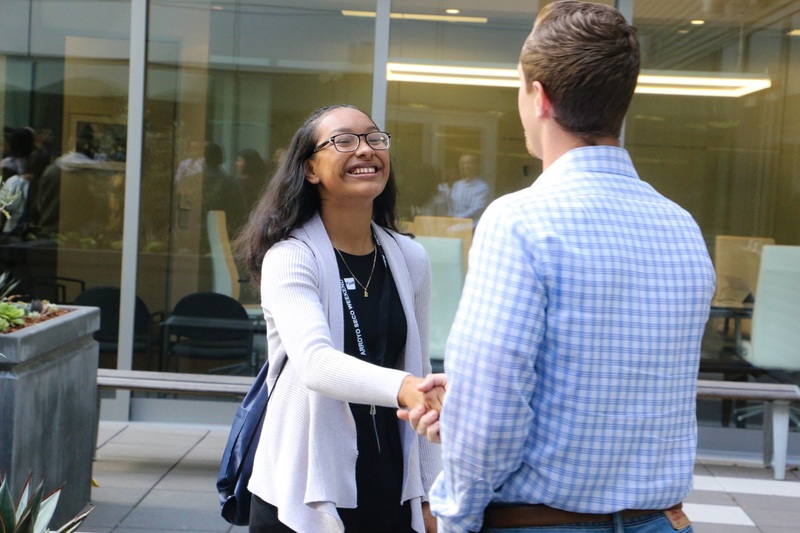 John Muir High School junior, Brenda Lopez shakes hands with her staff mentor for AEG’s Arroyo Seco Weekend Job Shadow Day at AEG’s global headquarters in downtown Los Angeles on April 26, 2017. 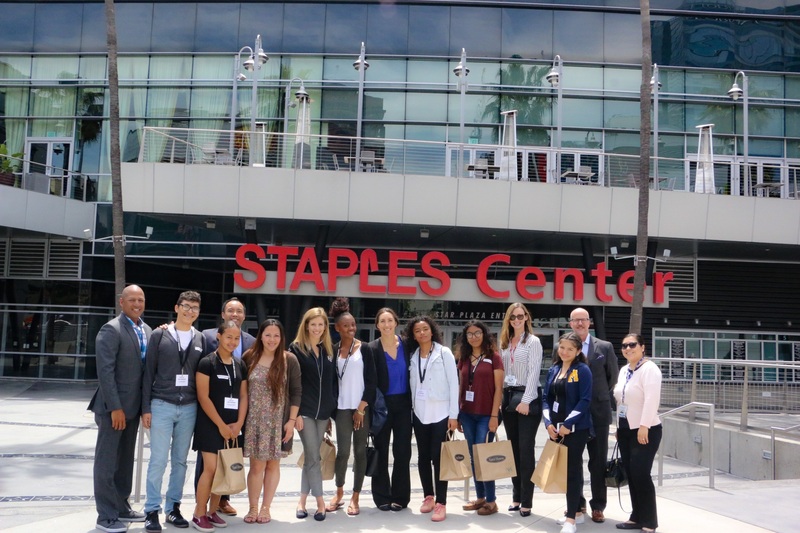 Students from John Muir High School and their AEG staff mentors gather in front of STAPLES Center during the first Arroyo Seco Weekend Job Shadow Day on April 26, 2017. LOS ANGELES, May 5, 2017 /3BL Media/ – AEG welcomed more than 30 students from Pasadena’s John Muir High School to its global headquarters in downtown Los Angeles on Wednesday, April 26 for the first Arroyo Seco Weekend Job Shadow Day. As part of AEG’s community outreach initiative with Pasadena Unified School District in conjunction with Arroyo Seco Weekend in Pasadena, Calif. in June, students were exposed to the company’s many facets of the sports and entertainment industry and received advice on future career paths. "This kind of opportunity truly opens doors to a whole new world for our students. The young men and women were very impressed by the hospitality extended by AEG and its employees, and inspired to see themselves in similar roles in the future," said Timothy Sippel, principal, John Muir High School. Following breakfast and a presentation about the company, students received a tour of the Goldenvoice and AEG Presents offices and were paired with a member of the AEG team to get one-on-one advice, receive interviewing tips and additional workplace insight within the entertainment industry. “We enjoyed having the students from John Muir High School spend the day with us. Their enthusiasm and interest in the music profession is inspiring. I hope that what they learned helps to broaden their perspective about the opportunities available to them and provides them with practical advice to help them pursue their dreams,” said Martha Saucedo, executive vice president of external affairs, AEG. In addition to the Arroyo Seco Weekend Job Shadow, AEG and Goldenvoice will also host “The Music Biz 101,” a panel exclusively for 200 high school students in the Pasadena Unified School District at the GRAMMY Museum at L.A. LIVE on May 11 and the Arroyo Seco Weekend Youth Program on June 20-21. Students selected to participate in the Arroyo Seco Weekend Youth Program will spend two days at the Rose Bowl in Pasadena learning about careers in music and entertainment including event production, marketing, and concert promotion; in addition to receiving professional advice on personal and career development. Headquartered in Los Angeles, California, AEG is the world’s leading sports and live entertainment company. With offices on five continents, AEG operates in the following business segments: AEG Facilities, which is affiliated with or owns, manages or consults with more than 120 preeminent arenas, stadiums, theaters, clubs and convention centers around the world including The O2 Arena, the Sprint Center and the Mercedes-Benz Arenas; AEG Presents, which is dedicated to all aspects of live contemporary music performances, including producing and promoting global and regional concert tours, music and special events and world-renowned festivals; AEG Real Estate, which develops world-class venues, as well as major sports and entertainment districts like STAPLES Center and L.A. LIVE; AEG Sports, which is the world’s largest operator of sports franchises and high-profile sporting events; and AEG Global Partnerships, which oversees worldwide sales and servicing of sponsorships including naming rights, premium seating and other strategic partnerships. Through its worldwide network of venues, portfolio of powerful sports and music brands, AXS.com ticketing platform, AXS cable television channel and its integrated entertainment districts, AEG entertains more than 100 million guests annually. More information about AEG can be found at www.aegworldwide.com.